Less than 48 hours ago, the evening sky promised another beautiful night of clear skies, a magnificent moon, and the delicate flickering of stars that cannot help but remind us of all the blessings of our world. And as we all know, we can never really know what’s just up ahead. In the hours since then, the miracle of fire, combined with the heavy fuel loads caused by years of drought, and the intensity of Southern California’s ferocious Santa Ana Winds, brought upheaval to the lives of so many in our community. Fires swept through the area with a fury rarely seen. Within hours, a small blaze became a fire that consumed several thousand acres, and in the hours since then, the “Thomas Fire” has grown to over 65,000 acres and counting. In the initial hours, our staff did all they could to protect The Ojai Foundation, before evacuating to safety. Since that time, we have waited and listened, talked to neighbors, and searched the news and emergency websites, in hopes of hearing something definitive about the fate of that place that has meant so much to so many of us. We also heard from so many of you, expressing your prayers, your good thoughts, and your hopes that all would be okay. Until the time of this writing—3pm Wednesday, December 6, 2017—all we had heard and read were rumors and conjecture, all trying to make sense of the bits of information we could find. This morning, several of our Executive Stewardship Circle—Laura, Brendan, and Shay—were able to return to the land to see firsthand for all of us, so that we could share the news with so many of you who we know are concerned. Indeed, the fire swept through the Foundation. 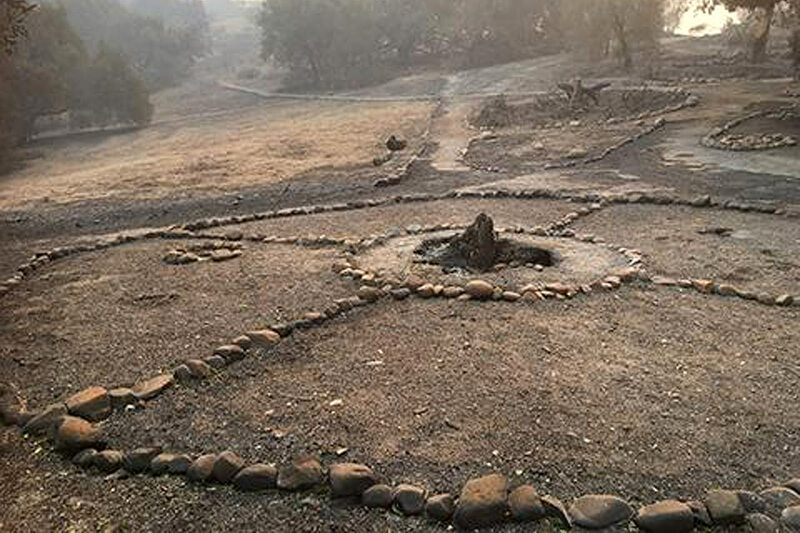 Many structures were taken by the fire, and some of the old friends remain. With the exception of Rock River and Owl, all of the hermitages, including the Sage House, were taken. The program and Upperlands kitchens, pottery studio, and tipi were also burned. The Gateway, the Office, and the Council House are intact. Frog and Grove bathrooms also remain. The Horizon Hut (Maha Yurt) sustained damage, and is mostly okay. The Teaching Tree survived, as did the Annie Besant Tree, the Amitaba Buddha, the shrines, and the Coyote/Dolphin statue. The surrounding landscape is barren and charred, showing us the power and the movement of the fire. We recognize that this news may come as a shock to many. We wish to send our deepest condolences to the current residents who have lost their homes and to all those who have given so much of their lives to create a place loved by so many. Questions come immediately for all of us. What will happen? What is next? How can we help? The situation is very fresh, and elsewhere in our community, the fires still rage on. We are working closely with the fire department and local authorities assessing what needs to be done. We have been deeply touched by the voices of so many offering to help—whether with financial support, tools, time, or hands-on efforts. For now, we are asking those willing to contribute in these ways (or others) to please send your name, email, and best phone number (if you are comfortable doing so). We also ask for your patience if we are slow to respond, as we are still in the midst of the crisis. We will let you know how to help as soon as we can. In the meantime, we wish more than anything to express our deepest thanks for the outpouring of love and support sent our way since this began. This is a challenging time for us all. We are deeply grateful to our staff, the firefighters, our neighbors, and our network of support, who have done and are doing all they can to respond to this situation. We are grateful for that which remains, and will allow us to continue on, and begin again. In these times, we will need each other, our practices, and our generosity perhaps more than ever. Please send your name, email, phone number, and any idea of how you see yourself helping to david@ojaifoundation.org.